It's time for a new recipe! 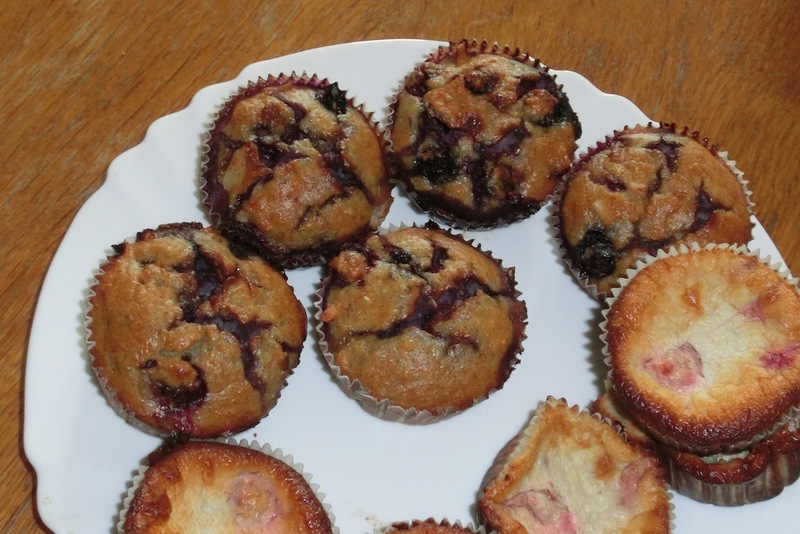 This time I'll show you how to bake really delicious paleo muffins. Just a few carbs (with low glycemic loads), no processed ingredients and still very tasty. A perfect fit for a diet like mine and also for a Sunday evening coffee and cake meeting (without a gain of weight). Preheat an oven to 350° F (approx. 180° C). Grease 12 cups of a muffin pan or fill them with paper muffin liners (if you don't have a muffin pan just use paper muffin liners alone, but then it's better to use 2 layers of muffin liners for 1 muffin). Now scrape the vanilla bean and melt the butter or coconut oil in a saucepan. Meanwhile you can start to prepare the dough. Add the bananas, the mark of the vanilla bean and the eggs to a big bowl and mix it with an electric hand mixer. Add the remaining ingredients (except the blueberries) gradually to the bowl while you are still mixing until the dough is creamy. Carefully mix in the blueberries by using a spoon or something like that. Pour the dough into the holes of the muffin pan or into the muffin liners and place it/them in the center the oven. Bake it for 30-35 minutes and enjoy!